**UPDATE: Toasty Kitten locates recipe! "'Art's Birthday' is an annual event first proposed in 1963 by French artist Robert Filliou. He suggested that 1,000,000 years ago, there was no art. But one day, on the 17th of January to be precise, Art was born. According to Filliou, it happened when someone dropped a dry sponge into a bucket of water. Modest beginnings, but look at us now. Filliou proposed a public holiday to celebrate the presence of art in our lives. In recent years, the idea has been taken up by a loose network of artists and friends around the world. Each year the Eternal Network evolves to include new partners - working with the ideas of exchange and telecommunications-art." 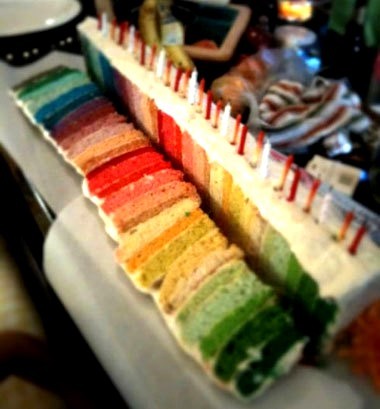 Whether you're interested in Art's Birthday or not, AWESOME rainbow cake!